Gross Area: 73,849 sq. ft.
Hastings+Chivetta recently designed three new projects on the campus of MICDS—Mary Institute and Saint Louis Country Day School, a prestigious, private K-12 college preparatory school located in suburban St. Louis, Miss. The new Steward Family Aquatic Center replaced the school’s 1960s-era Beaumont pool which served the needs of the school for many years. In the last several decades, the old mechanical systems became increasingly difficult to repair and maintain. They were causing a host of moisture-related problems throughout the facility, including condensation on interior windows and rust on key building components. The pool was run down with tiles falling off. Since there was no bulkhead, it was difficult for the facility to be used for multiple types of sports such as water polo and diving. Other spaces to be addressed were the outdated locker rooms and Hall of Fame. The prominently-located Aquatic Center respects the architectural context of the adjacent McDonnell Gymnasium. It features a dramatic two-story entrance in the heart of the main campus quad and incorporates an outdoor gathering space for students, teachers, parents and alumni. It can also be used for various school activities and camps. The new Hall of Fame space features MICDS athletic memorabilia and trophies. It creates a formal entry experience to the natatorium as spectators are guided down the wood-paneled halls to the pool. The natatorium welcomes spectators with its open and light-filled space (the old pool did not have any windows). 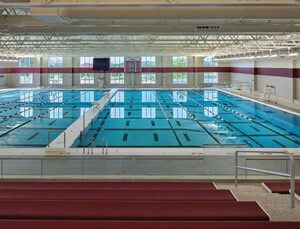 The 10-Lane stretch pool has a moveable bulkhead which allows for multiple groups to use the pool. A moveable floor bottom permits changes in the depth of the pool in certain areas to accommodate different kinds of programs such as youth swimming lessons and water spinning classes. The Ron Holtman Stadium is an open-air multi-purpose stadium that accommodates 1,000 fans. The gameday experience rivals that of any small college stadium. 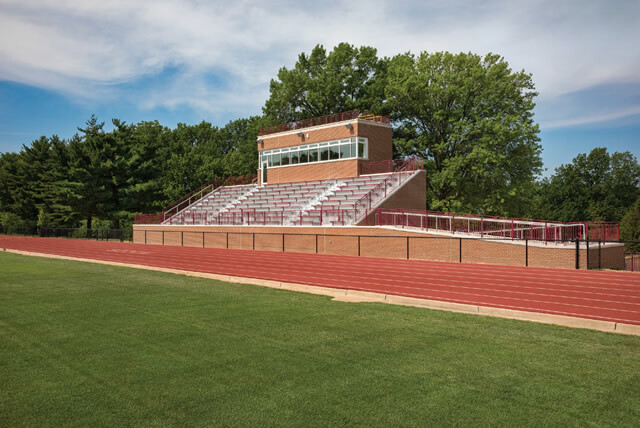 Key goals for the stadium were to strengthen the already-robust MICDS athletic program, enhance its regional presence, reduce weather-related down time and maintenance requirements and offer increased seating capacity. The stadium is equipped with a synthetic field that is striped for soccer, women’s lacrosse, men’s lacrosse and football. The Stadium also features a large press box, locker rooms, training rooms and team rooms for game day. The grandstand has open stairwell towers at each end. A separate Pavilion is adjacent to the Stadium and contains toilet facilities, concessions and an upper patio for watching events. MICDS Athletic Director, Josh Smith, says the facility is a big boon for the school as it sets the standard for K-12 stadiums and distinguishes the school in the extremely competitive St. Louis area private school market. The existing Track and Field Stadium, formerly the football stadium, was rebuilt as the Holekamp Track and Field Stadium and can accommodate 400 fans. The Stadium is the new home for the track and field team, and includes the addition of a small press box and a new synthetic high jump area in end zone of the existing track. The existing grass field will be used for Junior Varsity practice as well as physical education classes and general recreation. Maintaining the architectural integrity of the MICDS campus was a priority for the school. 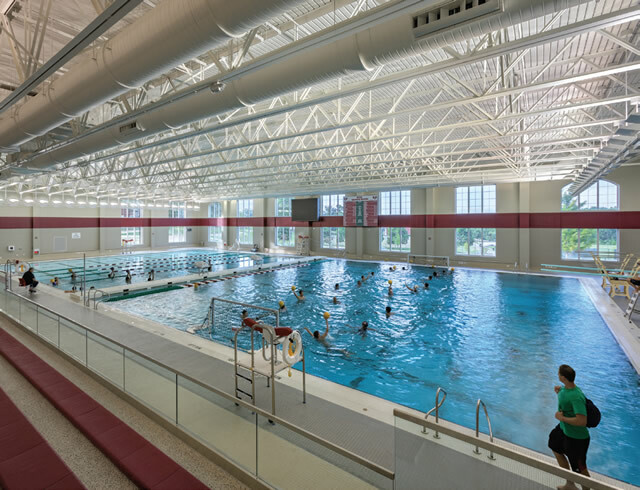 Hastings+Chivetta’s designers used the well-defined architectural vernacular of the MICDS campus to inform the style and material selection for the Natatorium, Multi-purpose stadium and Track and Field Stadium. The Colonial style influences the majority of the existing buildings on campus, with a more Traditional style reflected in newer construction, including the Natatorium. Common to both the new Steward Family Aquatic Center and Ron Holtman Multi-purpose Stadium as well as the renovated Holekamp Track and Field Stadium is red brick trimmed with limestone detailing. Features include arched windows with limestone keystones, decorative limestone medallions and limestone coping and banding details. Honoring school traditions was another priority for the school. The larger building footprint of the Multi-purpose Stadium required an existing pond to be relocated. The pond was important to the traditions of the campus so it was replaced and an updated wood platform was included. This was in response to one of MICDS’ longstanding traditions of allowing students to take a (fully-clothed) dive in the pond when they are accepted into college. The pond also features prominently in the annual senior class cardboard boat races. Nice open and light-filled space. Moveable bulkhead which allows for multiple groups to use the pool. A moveable floor bottom permits changes in the depth of the pool in certain areas to accommodate different kinds of programs.